Based on recipe found on the company website. Uses Pamela's Bread mix (19 oz bag available in grocery stores and on Amazon). Preheat oven to 350. Spray Pam on parchment paper on a large cookie sheet. 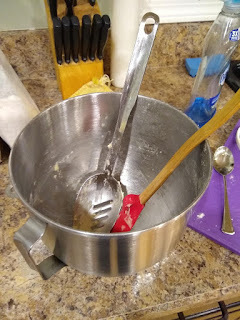 Mix all except the fruit together for three minutes on medium speed in a heavy duty stand mixer, or mix up to the first rising in a bread machine. Add the fruit and mix until well distributed. Put the dough into a large zip lock bag or pastry bag, cut the tip about 1.5 -inch long and "pipe" a spiral about 7 inches in diameter, and work your way in to complete the spiral. 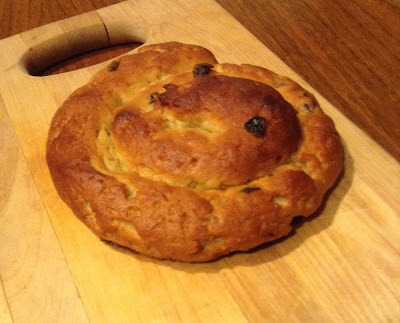 I will pipe 3 challahs for the holidays each in a spiral. Pam the top of the challah and cover with plastic wrap. Let rise for 60 minutes (or overnight in the refrigerator) then brush on an egg wash (egg yolk mixed with a touch of water). Make sure your pastry brush hasn't been used for gluten-bread if you want to keep the challah gluten free. Bake in a preheated 350º oven for about 45 minutes, or watch it. The challah is done when the internal temperature is about 195 º F (I use a meat thermometer) and looks a bit browned. Do not overbake. Let cool on a rack and then freeze in a Ziploc bag until ready to eat. Or don't wait for the holidays and eat it fresh out of the oven. Who am I to judge? You'll need another egg if you add an egg wash. Also, lately I've been very careful about not overbaking it, using a digital thermometer to take it out when it hits 195F, and well before 210F, where it goes stale very fast.